Ball Screw is made of screw and ball nut. It's function is to turn the rotary motion into linear motion which is a future extension and development of ball screw. The significance of the development is to move into a rolling bearing from sliding action. 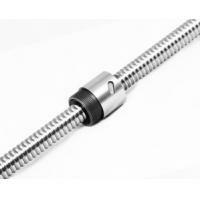 With little frication, Ball Screw are widely used into various industrial equipment and precision instruments. End machining 1. We can make end machining or without end machining ball screw. 2.For end machining ball screw, if you have special requirement, please show us the drawing. 3. Moreover, we also make the components of ball screw, such as ball screw nut housing, ball screw end support, couplings, etc. 3.Printing, paper-processing, automatic machines, textiles, etc. OEM&Customzied We can make the same size as other famous brand ball screw; If you need, please feel free to contact and show us with the drawing while inquiry. Thank you. On the screw and nut processing line with arc spiral groove, when they suit together, they form the spiral groove, and the race was full of ball bearing. The ball is along the groove rolling, and the back bead tube as the cycle of circular motion. Back bead also ACTS as blocking bead on both ends of the tube, in case the ball along the fell out of the race. SFU Ball Screw Model No. DFU Ball Screw Model No. Ball Screw End Supports Model No. Ball Screw Nut Housings Model No. Electronic machinery: measuring instruments, x-y platform, medical equipment, factory automation equipment, PCB drilling machine, IC packaging machine, semiconductor equipment, factory automation equipment,Etc.